I am a rectangular medium sized cardboard box, wrapped in yellow paper with leaves decoration. The closet, my home, opens and I squint my eyes from spending hours in the dark. I admire the bit of light that enters through the opening. Someone gently picks me up. I am placed in a brown paper bag. These gentle hands open me, place a stack of small white pieces of paper inside me, then close me with my lid. The papers inside me are getting excited! They are eager to be written on. A few seconds later, I see those gentle hands releasing a bundle of blue pens inside the bag, I salute them. They salute me back eagerly as they already know that all of us are going to spend the day in the field. Someone lifts the brown paper bag, and I enjoy the feeling of floating around. I hear a car door open, and I am placed inside the trunk. A couple of hours later, someone opens the trunk, it’s the same hands that I am so familiar with, they grab the bag from the handles, and once again, I am floating around, until I am placed inside a makeshift tent. I realize the people around me are all women, it seems it’s an event for the community-controlled Women Supporting Women program from the Dalia Association, the building that harbors my home: the closet. The program, as I am told from my neighboring paper documents in the closet, involves women groups to identify local community needs and priorities in their district, where they decide on which initiative and projects benefits them and their community needs. I wait on the table while I listen to creative ideas that these women present to their community. Right now, a woman is presenting her idea of using the wool from their herds of sheep to create products to generate income for the women of that region. I stay on that table and watch certain hands grab the delicious food around me. An hour later, someone opens my lid, takes out the little pieces of paper, and they distribute them to the crowd of women. The women write down numbers on the papers with excitement, then I am lifted and moved around these women, where each one of them drops their piece of paper inside me. Enthusiastic whispers are heard all around. The person who is carrying me closes my lid, I get a little dizzy as he shuffles me around. Then he opens me and takes out the pieces of paper one by one, reading the numbers on them. The numbers are counted on a flip chart. I hear the numbers one and two more than three and four. Then someone announces the results, 17 counts for project 1, which so happens to be the wool project. The crowd of women start clapping with joy. The community has decided that she will receive the small community grant to start her business idea. My role is done for the day. I am back in the brown bag and inside the trunk of the car. Two hours later, I am home in the closet. This is just one day from my journey in the fields across beautiful Palestine. I am back in the closet, and I eagerly wait for the gentle hands to pick me up again, so I can channel the voices of the people, their decisions, and their desires to achieve their own development for generations to come. During the last months, we distributed community grants to eight groups for the IBDA’ youth program that were identified, proposed, and selected by the youth groups, benefitting the local community, and making use of the local resources. • Saffa: The IBDA’ cafeteria, and the Murooj public park. The youth groups identified the need for a public space in the community to socialize and engage in social and cultural events, therefore they proposed the creation of Al Murooj Public Park and cafeteria IBDA’ to provide locally made food to the visitors of the park. • Mazari’Al Noubani: Service Center and Qurtaleh for the sales of traditional products locally and online. In an effort to revive the social and cultural scene of the village, the youth saw the need to establish a local shop for selling locally made products and handicrafts by craftsmen and craftswomen in the town. The name Qurtaleh is a traditional term for locally made baskets. In addition a service center is identified to provide a hub in the town for needed services instead of travelling to the closest city center to acquire such services. • Al Jiftlik: Sanabil Al Reef Kitchen and Al Ghuzlan sports and health center. The Youth in Jiftlik voted for the best two initiatives that they found needed in the community, Sanabil Al Reef Kitchen which aims to provide locally made food for the residents and for the nearby schools, in addition to a social space to share these nutritious meals. The second initiative voted for enthusiastically includes a health and fitness center for the whole community, run and controlled by the local youth. • Fasayil: Al Naseem Cafeteria and Fasayil‘s community garden. Again, you can feel the need of public social spaces everywhere you go in Palestine, and this has been confirmed by the proposed and selected initiatives in the communities. Fasayil, in the Jordan Valley, have also identified that one of the most pressing needs in the community is to have a public and social space for families and their children. Therefore, Fasayil’s community garden was voted for, and the Al Naseem cafeteria will provide locally made food by the women of the village. All of these projects above will have an economic element to generate income that sustains the initiatives. The student groups from the Orthodox School of Bethany in Al ‘Eizarya, also received two grants: Dance for life where they will hold Zumba classes and Kharbish Fankish for extracurricular activities, that will engage children and their families in fun and educational activities. We also held a public meeting to launch the IBDA’ program in Abu Dis, to serve the communities of Abu Dis, Al Eizariya, and Al Sawahera, all part of Jerusalem closed off by the Wall. An open meeting in the South of Hebron (Al Mufaqara, Al Tawane, Susya and Um El Kheir) was held as part of the Women Supporting Women, the women voted for two projects, including the production of yarn from local wool, and environmentally friendly agriculture to support food sovereignty. 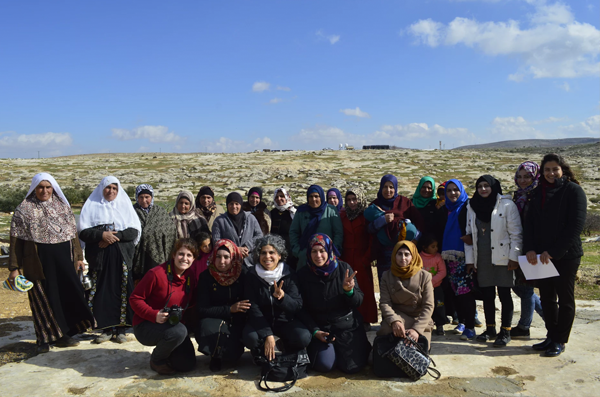 Both projects aim to strengthen the local economy and provide income generation to women of this area, especially that they live under constant harassments and arrests from the Israeli occupation, with home demolitions, land confiscations, and building illegal settlements. We also held a meeting to activate the village fund for Al Zawiyeh, in the Salfit governorate. The community discussed their priorities and needs and identified two to three initiatives to be addressed by this village fund. 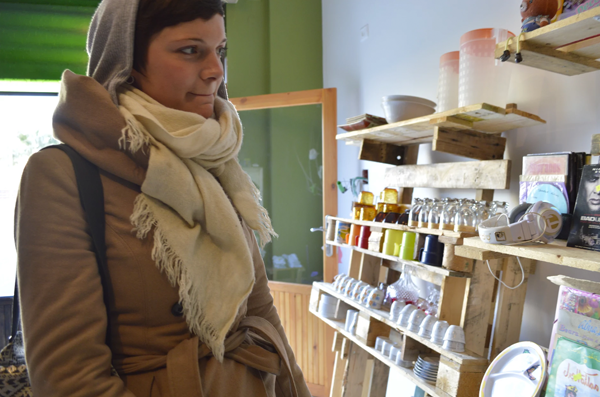 On the 2nd of February we opened our second hand shop initiative Dukkan, in Beit Sahour. The shop this time is hosted by El Bier Arts and Seeds, at Mary Well’s square. Dukkan is a physical manifestation of what the Dalia Association is about – strengthening community philanthropy. Many people donated their used items, because they believe in the philosophy of Dalia of community-controlled development, and mobilizing local resources. Dukkan is Dalia’s effort to make effective use of the resources available in our country, and to decrease waste going to landfills, thus decreasing pollution. The shop also increases access of needed goods at a budget price, so that everyone in our community can purchase what they need. This generates a bit of income for Dalia, and it will increase the number of our community-controlled grants, so that more people in our community can benefit from these grants, therefore decreasing our dependence on external conditional aid. Dalia, to me is a changing corner in my life. This has begun ever since I joined the wonderful team five weeks ago. This small team has all the love to the people of our community. 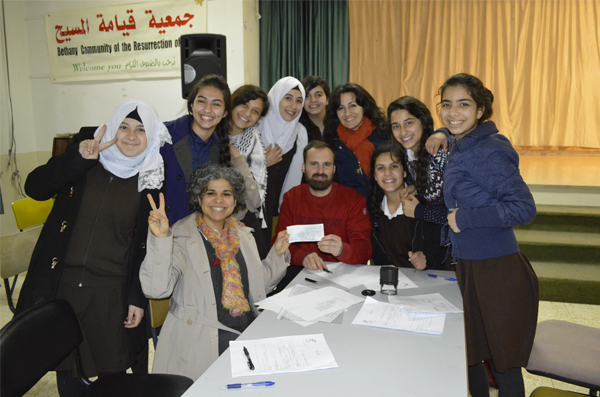 With very little resources, Dalia has managed to reach forgotten communities in Palestine. At the beginning, it was hard to see and understand the goal of community controlled grant-making, as I was wondering what a small grant can change? Then I realized it’s not about the grant itself, it's more about the long-term effect of bringing back trust of the people in themselves to produce their own solutions, without being dependent on external resources. The most remarkable experience was witnessing the Dance for Life student group; as part of the IBDA’ youth program. The group of six girl students from the Orthodox School of Bethany in Al ‘Eizarya, will organize Zumba classes for their school as extracurricular activities. The girls designed the project entirely, presented their idea to their community of schoolgirls, conducted questionnaires, and now they are bringing price offers from several trainers. The girls with slight supervision from a volunteer teacher are doing all of this on their own, the only thing Dalia has done was to tell these girls that they can do something! These girls will grow up with this attitude, and will achieve some change in the future; at least now they have acquired the critical vision of their communities and their needs and priorities, and are becoming active citizens in their community. 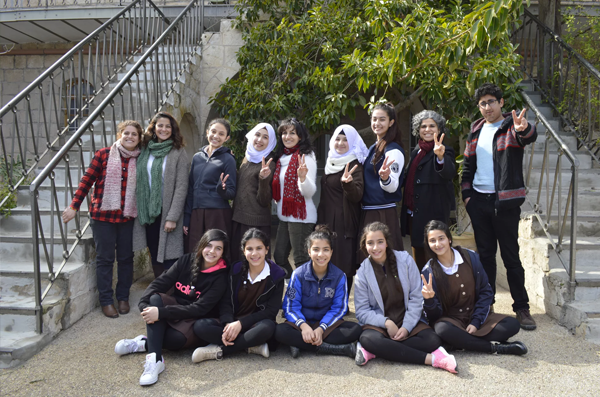 What we do at Dalia, we spread the word of community capabilities, by planting a seed to become a tree that, day by day, will grow and fill Palestine with fruits. David Jacobstein’s article ‘USAID embraces community philanthropy’, describes USAID’s shift towards supporting community development through a community philanthropy context. USAID, he continues, has adopted a local systems framework to support communities to address their own priorities within an inclusive and accountable process. Through the local systems framework, USAID has adopted the core principles of recognizing local systems and empowering them, tapping into local knowledge and expertise, designing a holistic approach and ensuring accountability and flexibility. While this is all good, USAID falls short in the implementation. In Palestine, for example, USAID often implements large projects by contracting US based private companies who then establish project offices in the recipient countries. Project priorities, activities and budgets are already determined prior to actual implementation. And while there may be some consultation with local stakeholders, the community has not been included in determining the priorities, nor in identifying the necessary budgets and available local resources including the technical expertise. USAID procurement rules often require the procurement of US goods and services rather than local. Further, USAID policies require the vetting of each individual benefiting from the project, thus, limiting the inclusivity, as certain individuals within a community may be deemed ineligible due to their grassroots activism or membership in a particular political party. When USAID addresses transparency and accountability, it is one way where the local community is required to be transparent and accountable in the project implementation, however, neither USAID nor the project implementing partner are required to reciprocate. In this arrangement, there cannot be any trust and respect for local assets and capacity. A community philanthropy model requires that all stakeholders are invited to participate at the table as equals identifying local priorities and ways to address them using all the available resources and assets, including any provided by bilateral donors such as USAID. While USAID has adopted important principles to empower communities, they have missed the point in community philanthropy. There are no donors or beneficiaries in community philanthropy. Everyone is equal and welcome to the table to discuss and address community priorities. USAID must reform its organizational systems and policies in order to truly support a community philanthropy model in the countries where it works. 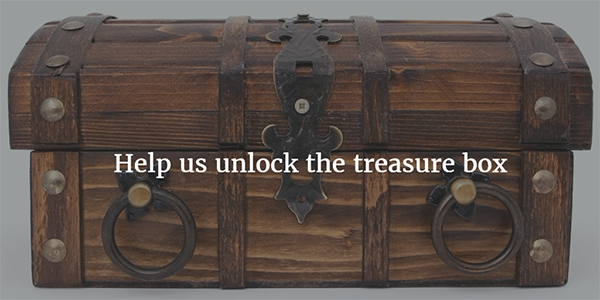 Help us unlock the treasure box! We have a donor who will match up to $1000 any new fund that is established at the Dalia Association. Help us double the amount by starting a fund in your name, or in memorial of a loved one, or your company’s name, or for a specific cause that is important to you such as your village or hometown, women’s rights, sustainable agriculture, empowering the youth, or the environment. 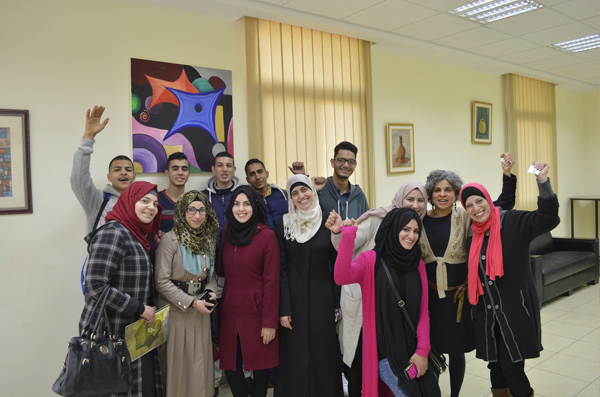 At the Dalia Association, Palestine’s only community foundation, we mobilize and properly utilize resources necessary to empower a vibrant, independent and accountable civil society, through community controlled grant making. Do you believe in the right of Palestinians to control their own resources for a vibrant civil society? Do you believe in our right to use community-controlled grants to achieve our needs and priorities? Start a fund now and support community-controlled development for a cause that is important for you.